Flower bulbs add a special touch of color to the landscape that are easy to plant and manage. Whether you have spring- or summer-flowering bulbs or both, well-draining soil, nutrients and planting depth are all important components to getting the plants off to a good start. A bulb planter is a foolproof way of getting the depth correct. This is important so plant shoots don’t have to go too far to see light and to keep tall plants from flopping over into the dirt. Using bulb planters can take the guesswork out of planting bulbs and make the process much quicker. This means your color display will take half the time but be just as beautiful. What is a Bulb Planter? When it comes time to plant bulbs, you can do it a couple of different ways. You can use a shovel and loosen the soil in the area to a depth of 8 inches (20 cm.) and then plant bulbs individually or in trenches. You can also use a bulb planter. These come in a couple different varieties. 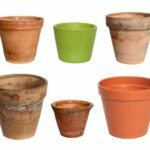 You may wonder, “Do I need a bulb planter.” Bulb planters in the garden are simply tools which can make the task easier and faster, but you can also rely upon your trusty spade. The general rule of thumb for planting depth is 2 to 2 ½ times as deep as the diameter of the bulb. Package instructions will have more specific digging and planting depths. These are the optimal depths for the bulb and will result in happier plants that don’t fall over and can get through soil easily. Using bulb planters not only facilitates the task but most have measurements on them to help you gauge how deep the bulb needs to be installed. Instructions on how to use a bulb planter will vary dependent upon the type of unit you purchase. Some are manual and a few can attach to a standard electric or battery powered drill. They are widely available online or at nursery centers. The simplest bulb planter is a little handheld manual device. These usually have depth measurements on them and simply core out the soil to the level at which the bulb should be planted. You can get one of these that requires you to kneel at soil level or a variety that is for standing. These generally have a foot rest that you use to press the tool into the soil, cutting a 2 ½ to 3 ½ inch hole (6.4 to 8.9 cm.). Some also have a plunger that allows you to release the soil you just cut out back into the hole on top of the bulb after you have placed it in the cut out. For those of us who like to work smart, not hard, there are drill powered models. These attach to a standard drill and cut a 2 inch (5 cm.) hole that is up to 9 inches (23 cm.) deep. A drill auger is similar and cores out holes up to 2 feet (.61 meter) in depth, a level that is actually too deep for most bulbs. Using bulb planters in the garden can be especially useful if you are planning a widespread color display and are planting dozens or even hundreds of bulbs. 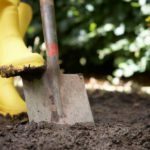 Most do not work well in clay soil but perform perfectly in loose sandy or even light to medium soil. Clay soils will need amendment, as they do not drain well and should be hand tilled the first time with plenty of compost and a bit of grit to increase drainage and add nutrients. The hand tools are pretty straightforward, requiring a bit of manual pressure to get the hole cut out. Drill powered tools need either electricity or battery power and are often most suitable for multiple plantings where squatting and kneeling while digging can be a nuisance. With any planter, you will be cutting out a plug of soil, placing the bulb and then either releasing the soil from a plunger back into the hole or covering the hole manually. These tools make bulb planting faster and easier than standard spade digging and can get you on the road to a spectacular seasonal color display in half the time.